Sal Martella is President and co-founder of Progressive O&P, Inc. since its incorporation in 1999. Sal is the senior practitioner here at Progressive O&P and his dedication to his patients is unparalleled. 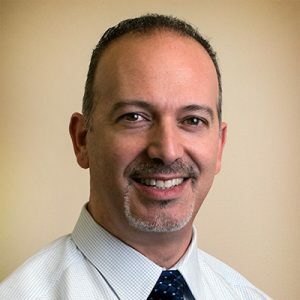 Sal has been an American Board Certified Prosthetist since 1995 and an American Board Certified Orthotist since 1996. He earned his Bachelor of Science degree in Prosthetics & Orthotics from Florida International University in 1993. He is a member of the Amputee Coalition of America and of the American Academy of Orthotists and Prosthetists. I love doing what I do because I get to help people reach their ultimate goal of living their lives to the fullest once again. Watching patients exceed even their own expectations is a mesmerizing experience. Sal Martella is an expert in Spinal Orthotics for management of Scoliosis and other spinal pathologies, and is certified to fit Genium, X-3, C-Leg™ and Rheo™ microprocessor-controlled prosthetic knee technology, Harmony™ and LimbLogic™ elevated vacuum prosthetic socket systems, Proprio™ microprocessor-controlled foot technology, and all aspects of myoelectric prostheses, including Dynamic Arm™, I-Limb™, and Utah Arm™. Sal was a competitive bodybuilder for many years. His thoroughly detailed knowledge of the musculoskeletal system enables Sal to make difficult clinical decisions and expert diagnoses. Below the Knee Patient Can Lose the Cane! Do You Know How To Properly Don Your Prosthesis?